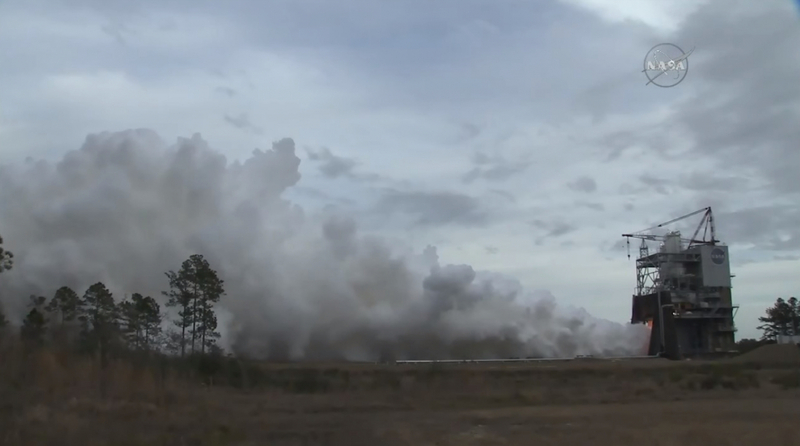 NASA and prime contractor Aerojet Rocketdyne are continuing a fast pace of RS-25 test firings with another single engine test on Thursday afternoon. Following a little more than two weeks after the last test, Development Engine 0528 (E0528) ran through its test in the A-1 test stand at the Stennis Space Center in Mississippi. 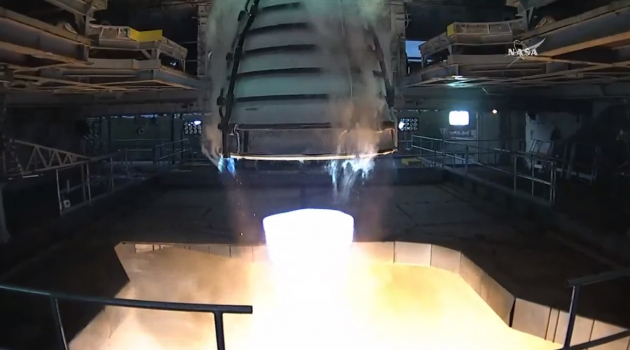 Another six-minute long firing will exercise another test case for the new, “3D printed” pogo accumulator assembly and will acceptance test another engine controller unit (ECU) for use on one of the early Space Launch System (SLS) launches. The Stennis test team of personnel from NASA, Aerojet Rocketdyne, and facilities contractor Syncom Space Services (S3) once again took the engine through an event-driven countdown on Thursday. Rather than targeting a specific time of ignition, the test will start when all of the prerequisite steps prior to ignition are complete and the hardware and the people are ready. Ignition occurred at 4:34 pm Central time (22:34 UTC). In an email, Philip Benefield, Systems and Requirements Team Lead for the SLS Liquid Engines Office, told NASASpaceflight.com that the two primary objectives for this test are similar to the last one on January 16. “[There are] two primary objectives: Greenrun of ECU FM11 [and] demonstrate POGO stability at max conditions,” he said. All major new or refurbished flight engine hardware is acceptance tested or “green run” in a ground test before being installed on a flight engine; after today’s test, the FM11 unit will be installed on a fourth engine designated for the second SLS launch, completing that set. Those engines will also serve as spares for the first SLS launch, Exploration Mission-1 (EM-1). Benefield said that Thursday’s test was planned to have the same duration as the last, 365 seconds. During the firing, the engine will be throttled primarily at the high and low end of the production restart range of 111 percent and 80 percent of rated power level (RPL), respectively. E0528 was throttled at 111 percent RPL for 177 seconds, and at 80 percent RPL for 148 seconds — “we’re essentially using the same thrust profile as last test,” he noted. The production restart engines will be certified to fly at 111 percent, with future plans to ground test up to 113 percent RPL. To help satisfy objectives for the test, Benefield also noted that the engine was to be started at an edge of its “start box” on both the liquid oxygen (LOX) and liquid hydrogen (LH2) sides. When shown on a plot of temperature versus pressure as measured at the engine inlets, the start box depicts the boundary values that are considered to be acceptable to start the engine. Temperatures and pressures at the engine inlets would normally be expected to be closer to the middle of the start box at ignition; however, in development tests or using development equipment on the ground, test firings routinely explore more extreme conditions in order to better understand operating margins. Thursday’s test will include starting E5028 with high pressure conditions at the LOX and LH2 inlets. The pogo assembly is the first of many major engine components that are being manufactured and assembled using newer, more cost-effective processes that will be used to produce new sets of RS-25 engines for future SLS vehicles. Plans call for both ground-test RS-25 engines to be fired many times this year. Although the new parts will largely retain the fit and function of the old ones, they will be extensively tested in ground test firings individually with existing engines and as a whole with new builds. The ground tests also continue to acceptance test or “green run” enough new engine controllers to round out flight hardware for the sixteen engines that SLS inherited from the Space Shuttle Program. More widely known in the Shuttle program as Space Shuttle Main Engines (SSME), the design at the end of the program was adapted for use on SLS. The operating ranges of the engine such as pressures and temperatures were expanded to meet the higher performance requirements for SLS without having to modify most of the hardware design. The major new development for the engine to take it from an SSME to a RS-25 “adaptation” engine was a new engine control system. The new system, including a new engine controller, was developed to replace the 1970s-vintage engine computers that flew during Shuttle. 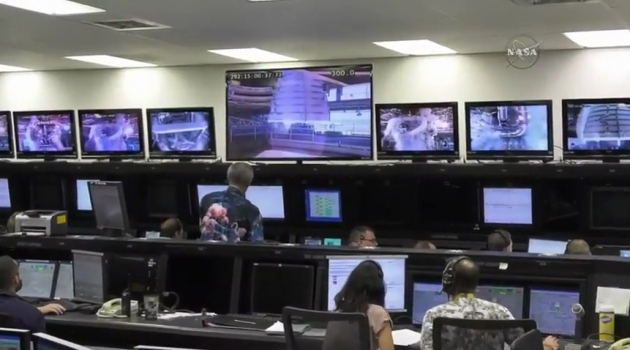 Each engine has a dedicated, self-redundant controller unit that controls its operation, monitors its health, and communicates with the launch vehicle flight computers. 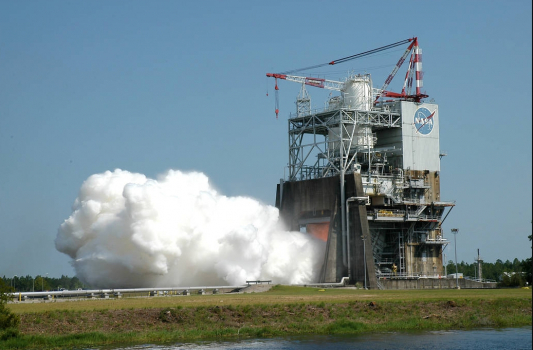 Hot-fire testing of the RS-25 adaptation changes for SLS began in January, 2015, in the A-1 stand at Stennis. SLS is both physically longer and at times will accelerate faster during launch than Space Shuttles did, requiring different opreating conditions for the engines from start through powered flight to shutdown. The four engines in the SLS Core Stage will start and run at higher pressures than the three did in Shuttle, and the hydrolox propellant is also fed to them at colder temperatures. SLS will also run the engines at higher thrust levels than Shuttle through most of flight. At the end of the Shuttle program, the engines were normally operated at 104.5 percent RPL; for SLS, the adaptation engines will run at 109 percent RPL and then 111 percent RPL for the production restart units. 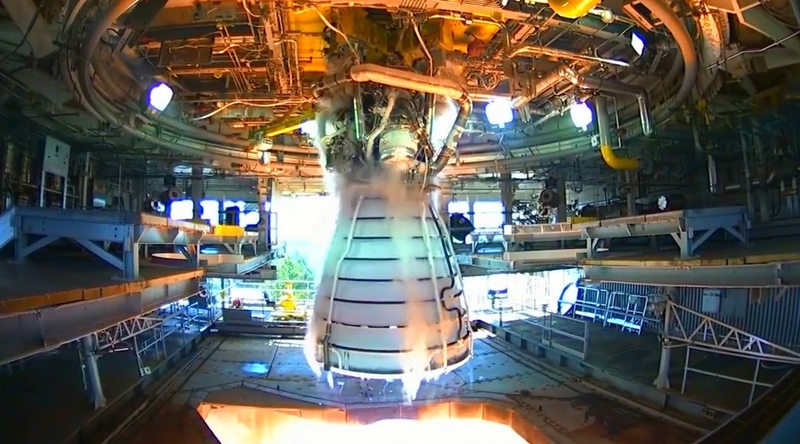 The single-engine, hot-fire test objectives for certifying the adaptation engine changes were completed at the end of 2017, and the sixteen Shuttle holdover engines will be ready to fly on the first four SLS flights once they receive a new, test-qualified engine controller. With SSME production long since retired and the need for new engines by the time the fifth SLS Core Stage is being assembled, NASA contracted SSME prime contractor Aerojet Rocketdyne to restart production of the engines for SLS, with cost-reduction goals being a priority. SLS is an expendable launch vehicle, and so some of the design requirements like those for service life are not as high as when the engines flew on Shuttle. 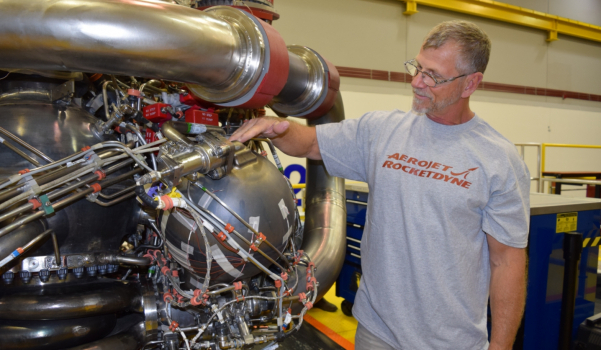 NASA and Aerojet Rocketdyne are introducing modern manufacturing methods into the restarted engine production, such as additive manufacturing (also known as “3D printing”). The new pogo accumulator assembly was manufactured using an AM process called selective laser melting (SLM) that significantly reduced the number of parts needed for assembly and the number of welds, also reducing the unit cost by a third. Thursday’s test is the third of four hot-fire tests of E0528 in the Retrofit 1a series for production restart. The next test to complete the series is currently planned for around February 21. After the late February test, E0528 will be removed from the A-1 stand and returned to Aerojet Rocketdyne’s Stennis facility for more extensive retrofitting with production restart hardware. Its place will be taken by the other development engine, E0525, which itself is being retrofitted with new parts. In addition to the pogo assembly, plans were to retrofit E0525 for the upcoming tests with a main combustion chamber using new manufacturing methods. In between the end of the E0528 Retrofit 1a tests and the E0525 Retrofit 1b tests, the A-1 test stand will also be modified to enable RS-25 engines to be gimbaled during future hot-fire tests. The production restart design will incorporate flex hoses instead of flex ducts to help reduce overall costs. As with other requirements that changed when going from Shuttle SSMEs to the adaptation engines to the production restart engines, the engines won’t need to gimbal as much in the SLS configuration. On Shuttle, the maximum gimbal requirement was about ten degrees; for the first four SLS launches with adaptation engines, the requirement is down to eight degrees and for production restart the requirement is six degrees. The capability to swivel or gimbal an engine in the stand while it is firing will allow the design changes for the flex hardware to be fully qualified on the ground.